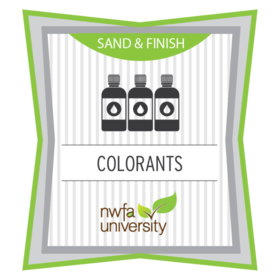 The earner of this badge has completed the NWFA’s online courses for Stains, Water Popping, Aniline Dyes, Wood Bleach, and Reactive Conditioners, and has passed an assessment associated with each course. This individual has also passed a hands-on test associated with the skills presented in this course. Yes, make National Wood Flooring Association a Trusted Issuer. This will automatically accept all pending and future Credit from National Wood Flooring Association. By removing trust, badges created by National Wood Flooring Association are no longer automatically accepted and you'll need to review in your inbox before accepting.